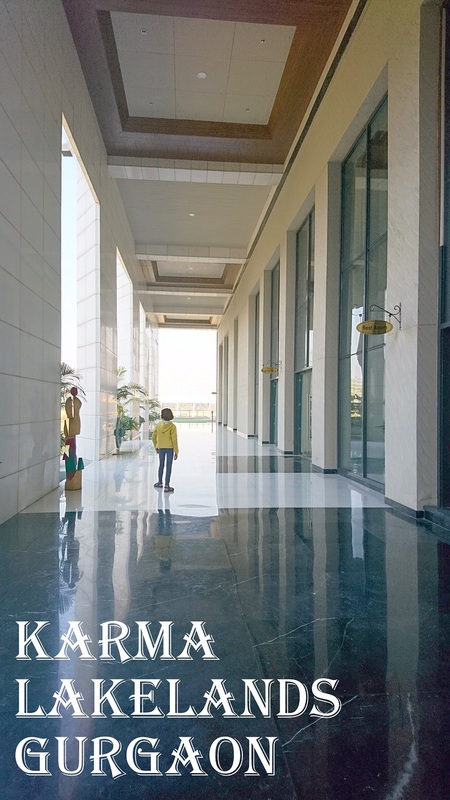 My daughter Chhavi and I recently went for a staycation at Karma Lakelands at Sector 80, Gurgaon. We were invited to the resort! The map picked up multiple locations for Karma Lakelands. But do not worry about it, pick up the Golf Course Location. Once you reach there, the security would direct you to the Klub House which is also the reception of the Chalets and the Villas. When you walk around the reception, one of the first things you would notice is the roof of the car park! It is made of solar panels! I quite like places which invest in clean energy and take other environmental measures. Rain water harvesting is another big thing on the campus! 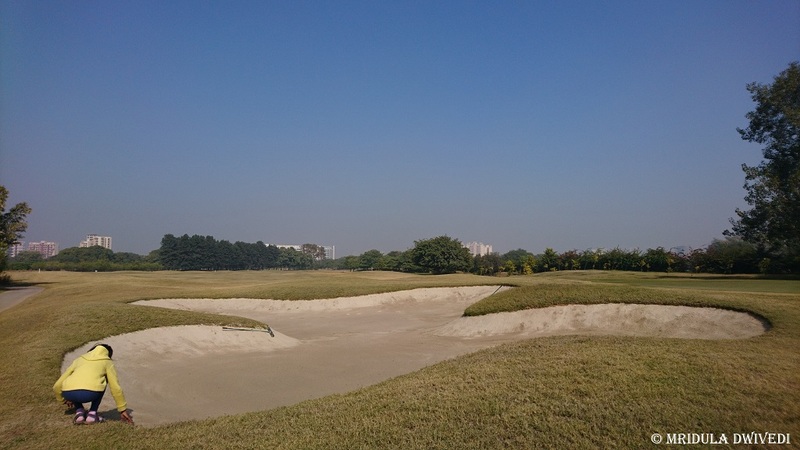 The campus has a nine-hole golf course, luxury villas both for purchase and short stay and chalets for short stay. We stayed in a luxury villa. It had four bedrooms on two floors, two large living areas, kitchen and a lawn at the back. There was a swing at the front which Chhavi quite liked. The villa was decorated tastefully. 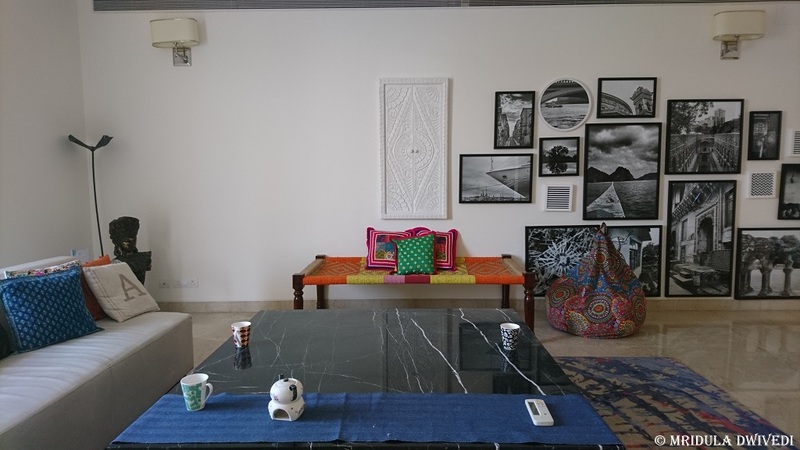 Chhavi and I both enjoyed looking at the artworks, we were always discovering something new! The Villas would be suitable for large groups. The master bedroom of the villa has a bath tub with a Jacuzzi. The Villa We Stayed At! The Chalets are cosier. We looked around one of the chalets, it would make for an ideal place to relax for small families. Chhavi liked the hammocks around the Chalets and immediately parked herself in one of them! The chalets have been decorated with the same good taste as the villas. Depending on the group size, either can make for a good holiday. The Klub Karma is the hub of the place. It is geared to supporting the golfers who come for the game, particularly on the weekends. It has a restaurant which procures a lot of food from the farm with the sprawling 300 acres campus. The restaurant is open till 10.30 at night. There is a table tennis table next to the restaurant, On Kourse, you will also find a carom board in the same area. 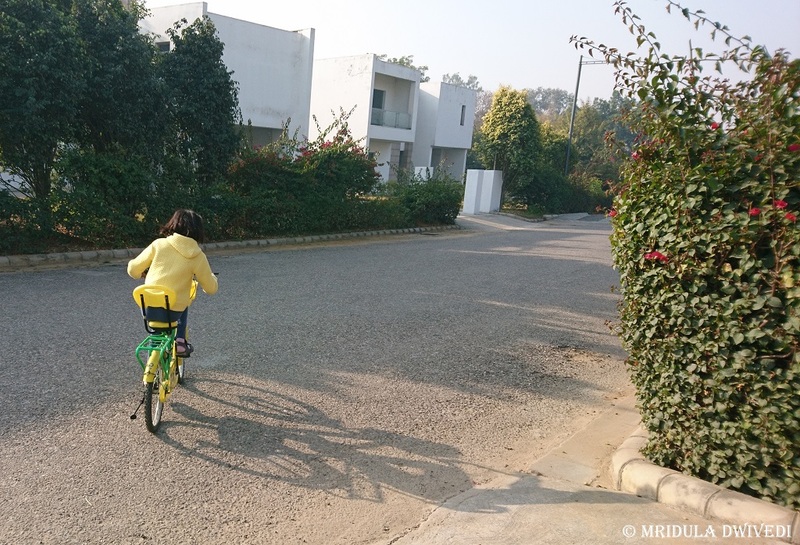 You can borrow a cycle at the hut and it was Chhavi’s favorite mode of transport during our stay. 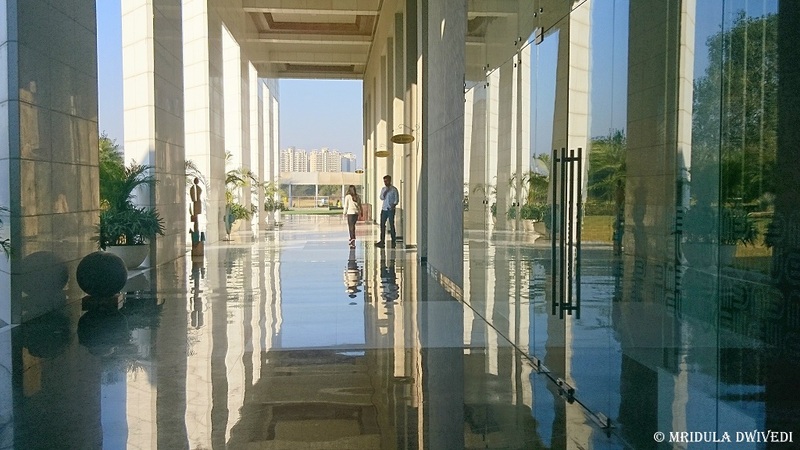 There are tennis and badminton courts too within the premises. 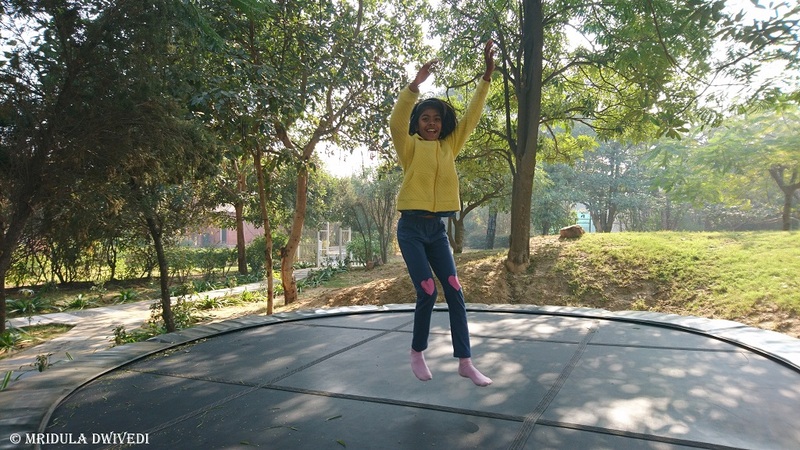 However, the animal farm and the trampoline was what Chhavi enjoyed most. She went around talking to the goats and cows. She also jumped to her heart’s content on the trampoline. Farm Fresh Strawberries and Carrots! There is a flower and vegetables nursery and it was a delight both for Chhavi and me to eat farm fresh carrots and strawberries. The campus is huge and serene. It s full of trees and vegetation. It makes for such a refreshing change from the dust filled Gurgaon. As both Chhavi and I enjoy water a lot, we were mesmerized with the outdoor pool. It makes for beautiful reflections of the Klub House. Only in Jan it was too cold to get into the water. There is an indoor pool and jacuzzi too. Chhavi enjoyed it as she packed her swimming costume, I had to sit out as I forgot to pack mine! We had a fun filled stay. If you are looking for a relaxing yet active staycation, you should look at Karma Lakelands. PS. 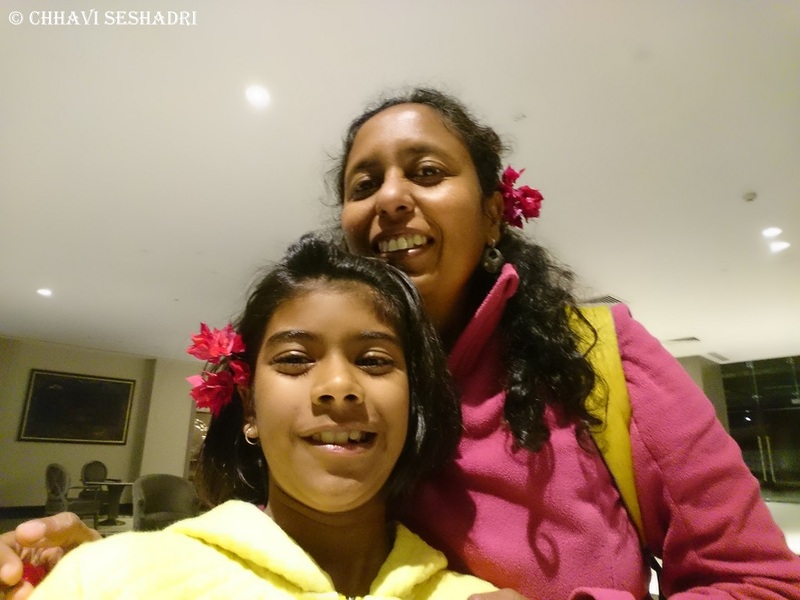 I was invited along with my daughter for the staycation at Karma Lakelands!